Keeping in mind the global need of medical knowledge, sqadia.com follows medical books that are accepted throughout the entire world, so that every medical student can get advantage of the medical lectures made by sqadia.com. This lecture hepatocellular carcinoma (HCC) is also designed by following the instructions of the book of internal medicine i.e. ¨Harrison's Principles of Internal Medicine. It covers all the important medical aspects of this malady from etiologic factors, staging and classification to its diagnosis along with certain preventive strategies. In the end, treatment approaches for all the four stages of hepatocellular carcinoma has been shed light upon. 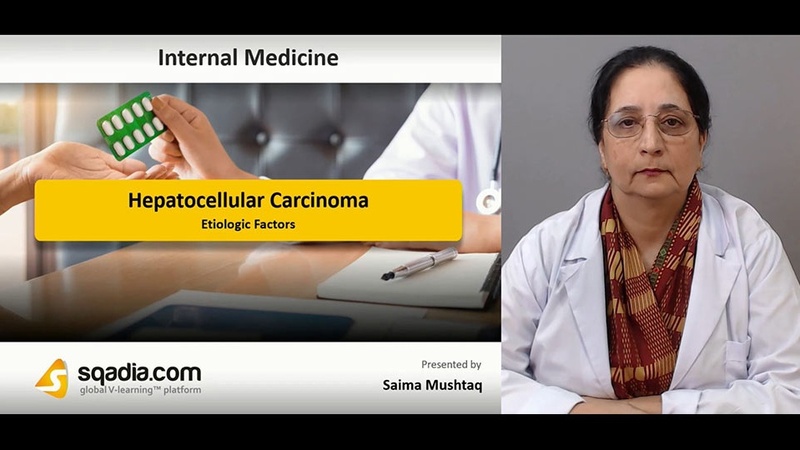 Etiologic factors of hepatocellular carcinoma are discussed expansively in the medical video lecture at the platform of sqadia.com for medical and MBBS students. There are a range of etiologic factors which lay the foundation for hepatocellular carcinoma, a most common malignancy. Chemical carcinogens are one of the major causative factors. These include aflatoxins synthesized by fungi, alkaloids, tannic acid and pesticides. In addition to these, certain other common causes encompass carcinoma owing to HBV or HCV infection, alcoholic consumption, NASH and mycotoxins. Some of the unusual causes, however, includes diseases like hemochromatosis, citrullinemia, Wilson’s disease and many other associated medical conditions. This malady presents with various features which are abdominal pain, jaundice, central necrosis and bone pain. 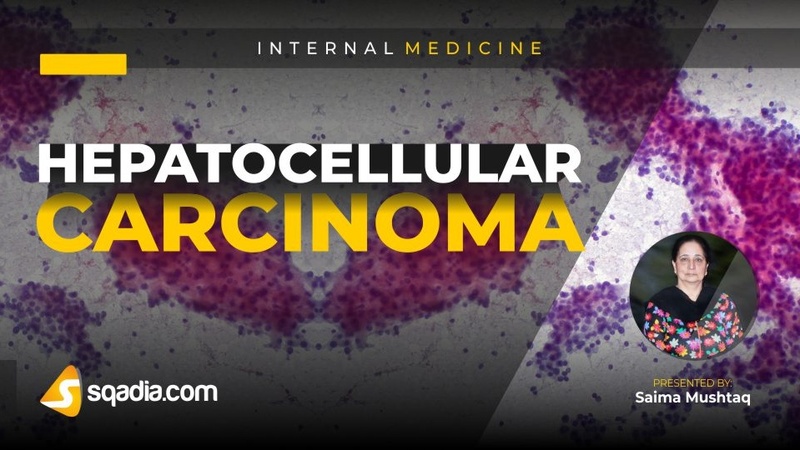 Paraneoplastic syndromes have also been shed light on which has its own clinical presentation having features like biochemical abnormalities, hypercalcemia, thrombocytosis and many more. For the better comprehension of MBBS students, medical specialist at sqadia.com aims to elucidate staging and classification of hepatocellular carcinoma using medical definition. Hepatocellular carcinoma has been staged under TNM classification. Based upon that, it has four stages out of which stage I shows the best prognosis whereas, stage IV demonstrates poor prognosis. Symptomatic treatment regime varies based upon the stage of the disease. There are two types of classification methods; one is CLIP classification and other is the Okuda classification. In evaluation of the patient, history of ailments like jaundice, drugs regime, hepatic nodularity ought to be noted down. Radiographic techniques include liver ultrasound, helical CT scan, bolus technique, FDG-PET and gadolinium enhanced MRI. For the better understanding of medical students, in depth elaboration is given on diagnosis and prevention of Hepatocellular carcinoma. Diagnosis and prevention hold its significance. Out of a variety of diagnostic techniques available, serologic assays are one type, majorly the AFP-L3 assays. In addition to these, liver function tests (LFTs) are also carried out. Pathologic diagnosis, however, includes core liver biopsy and fine needle aspiration. These may employ laparoscopic approach. Screening, on the other hand, can be done via ultrasound, gamma glutamyl transpeptidase detection and by ablation. Vaccination, avoidance of aflatoxins consumption, chemoprevention and HCV therapies are one of the few preventive strategies. Stage I and II treatment of HCC is discussed comprehensively in the medical video lecture at the platform of sqadia.com for medical and MBBS students. Treatment regimen for stage I and II includes surgery, local (RFA, CT scan and MRI) and microwave ablation, injection therapies (ethanol) and transplantation (OLTX). Liver transplantation has high tumor recurrence rates. Current directions include downstaging of hepatocellular carcinoma by medical therapy (TACE), treatment before OLTX and usage of salvage OLTX. A novel treatment strategy can be the adjuvant therapy which employs antiviral therapies or Peg-interferon plus ribavirin. For MBBS students, the stage III and IV treatment of HCC are enlightened comprehensively in medical video lectures of sqadia.com for better understanding. Treatment strategies for stage III and IV include systemic chemotherapy, intake of kinase inhibitors and certain new therapies involving external beam and conformal radiation, 90yttrium therapy and course of drugs (bevacizumab). Epidermal growth factors (EGF), cMET, IGF-I, VEGF receptor inhibitors are one of the few inhibitors which can be employed for alleviating the malady. However, regional chemotherapy can also be carried out. This may include the dosage of doxorubicin and cisplatin and regional hepatic arterial chemotherapy. Despite these options, non-surgical responses must be evaluated as well. Monitoring and analysing plasma AFP response, tumor shrinkage and survival is also done.